I was at Quilt Market in Minneapolis a few weeks ago. I met a bunch of folks and picked up a bunch of new work that I can't tell you about yet. What I can say is: I need to get this studio organized and keep it that way so that I can keep up with the New! Secret! Projects that will consume most of my time for the remainder of 2015. Last week I showed you one of my clean longarm machines. It is still clean and I've added some organization to it. I now have a basket on the back of the table that holds the scraps from the current project, all of the threads for that quilt, and all of the templates/tools for that quilt. My stuff is all in once place now and when the project is finished I will empty that basket so that it is ready to be filled by the pieces of the next one. Do you think that I can keep this up? And can you guess what new Cutie pattern sample I just made from those fabrics? This week I found the back of my other longarm, my beautiful Handi Quilter Fusion named Belle. The Hello Kitty in winter clothes is now sitting on the shelf with her Hello Kitty friends. The cover to my Janome 6600 is now actually on my Janome 6600; don't die of shock. The spare crank for my Fusion is now on the shelf waiting for a day when hubby and I can work on adding it to my front roller. The unquilted tops are on a shelf with their friends. The knitting needles are back in their box and on the shelf where they belong. Phew! My machine is cleaned and ready for me to load a new quilt on it. I'm ready to work! She's dressed in a winter coat to survive the brutal winter in New York. 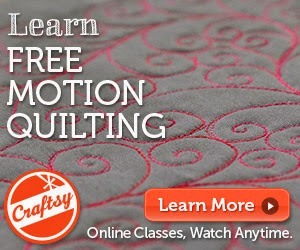 Have you seen my Craftsy class yet? During the last few weeks, I was tickled to be involved with the #Springcleanyourstudio blog hop organized by Cheryl Sleboda. I was inspired be seeing all of the lovely studios the other bloggers shared. I also appreciated the incentive to clean up areas of my own studio. Now that it's over, I decided to keep the cleaning alive. My studio is cleaner, yes, but there is so much more to do! That is a huge pile of I-don't-know-what. Some of it was filed and some of it was tossed. I shelved the stack of magazines. I had quilts or articles in each of those magazines, by the way. They are all nicely organized on a shelf with all of the other magazines containing quilts or articles by/about yours truly now. The batteries now have a new home in hubby's office; they are his problem now. The ends of my trekking poles are now housed with the rest of my hiking equipment. I have absolutely no idea how a) they ended up in my studio or b) how they found a semi-permanent home on the back of one of my longarms! It is now free of clutter and ready to quilt a quilt. Which one should I load next? After four days of the worst laundry-drying weather ever, I am tickled that I have three loads of laundry on the line and they are all drying! Hanging clothes to dry is one of my favorite things in the whole world! Yes, I'm easily amused. My electric bill is lower, my clothes last longer, and they smell like sunshine. Sigh. I couldn't find the original picture, so this is a low-quality downloaded-from-Instagram photo of the last time I made it. Tonight I will skip the broccoli since we ate it all last night, but I have spinach in the fridge so that'll do. The recipe is from Isa Does It, the amazing cookbook that my favorite daughter gave me for my birthday this year. I try to eat vegan whenever possible and have tried many not-really-cheese recipes. None have ever come close. This does. It's not cheese because.... mmmm... cheese, but it's a darn tasty sauce that is now my favorite comfort food. The breaded tofu recipe is in that cookbook, too. So a week of icky (read: bad for hanging laundry) weather and a migraine yesterday means I deserve these favorites on this Friday. I'm tickled to introduce my newest Cutie Pattern, Vintage. Pantone named Marsala as 2015 Color of the Year, and we chose Marsala as the background for this latest Cutie Quilt. We used Timeless Treasures Studio C fabrics and I love the finished quilt, especially since it is queen-sized at 90x90 and I can use it on my bed! If you don't know what a Cutie is: it is a fat eighth cut of fabric. The Quilt Basket packages 16 fat eighths together in Cutie Packs and any Cutie Pattern will work with any Cutie Pack of fabric. I am so excited to be a part of this project! I love that I can buy a $20 pack of pretty! new! fabrics and make a quilt out of them I have so much fabric that it is often difficult to justify buying a more expensive kit. 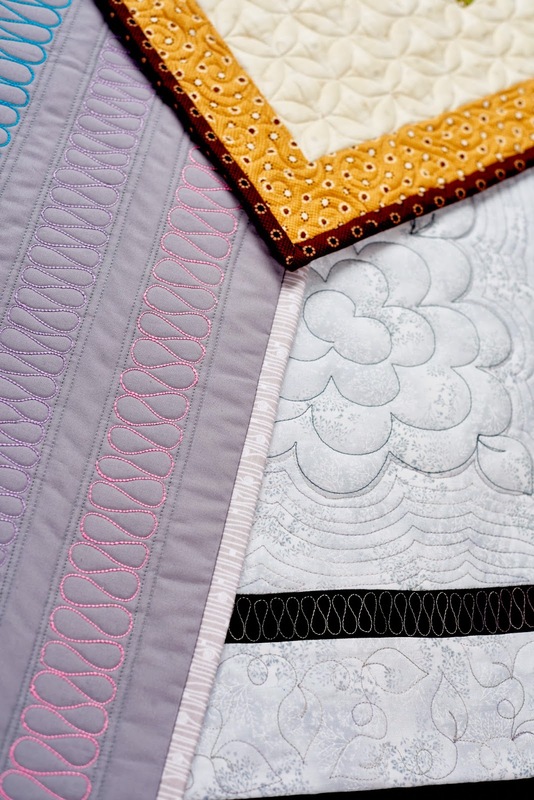 If you like the quilting in my samples, I teach some of those designs in my Craftsy Class. #Spring Clean Your Studio Blog Hop -- MY DAY!!! Welcome to all of the #Springcleanyourstudio Blog Hoppers! Today is my day to show the before and after photos of my studio. In some ways I thought today would never get here, but in other ways it's too soon because my studio needed so much help! Question: How did my studio get so messy? Answer: I travel constantly teaching quilting and I'm either making a mess while packing or making a mess while unpacking or making a mess while getting some quilting done in between trips. Hello Kitty on my cutting table? But of course! She belongs on top of my HQ Sweet Sixteen. Nail Polish remover? Well, the time between the last snowfall and 93*F was 14 days. I went from my Craftsy class pedicure (in February!) to sandals weather in a big hurry! Chocolate? Do I really need to explain that one? I loaded a Coursera lecture on my phone and set myself to cleaning while listening. I put away all of the things that didn't belong in my studio, put away all of the things that did belong in my studio, put the chocolate in the basement because it will melt in my hot studio (I don't have A/C), dealt with the fabric scraps left from old projects, and made some decisions on what to keep on my work table. I flipped through a few to decide "keep or pass along." I put the "keep" ones on a book shelf, the "pass along" ones in my giveaway bag (I'm very popular at my quilt guild meetings), and the rest were stacked on my quilting bookshelf to go through when time allowed. Quilt Market is this week and I knew I wouldn't have time to go through every single book, so I started with one shelf. I pulled out a few that I knew I didn't want any longer and checked them with my BookScouter app. I scanned the barcode to see if any online re-sellers would buy from me. So far I have sold my books to SellBackYourBook.com, Textbooks.com, BookItBuyBack.com, and Powells.com. The books that won't sell get added to my giveaway bag. That is a laundry basket full of old shirts waiting to be made into quilts, a bag full of flannel left here when a friend moved away, a Tiffany wineglass box full of random stuff, and a Hello Kitty purse. Don't judge me. Other random stuff was there, too, but those are the easily identifiable bits. My pins are in a cute Hello Kitty tin pail. I keep my wrist magnetic pin cushion clipped to the side so I never lose it! The rotary cutters are now in the cutest Hello Kitty watering can that is a recent gift from my sister; it never had a real home and now it does! I lined up all of my cutting rulers in a rack that a student's husband made for me. My magazine basket is now empty. I keep throwing things in there and pulling them back out. I need to get rid of the basket before it fills up again! I've made about $80 on the books I've sold from my bookshelf. I'm sure I'll find something (wink*fabric*wink) to spend it on! The flannel was boxed to donate to the library sewing group. The shirts were boxed and added to the boxes of my dad's shirts waiting to be made into memory quilts for his grandchildren. A lot of other stuff was thrown away. The mantle is a display for my Hello Kitty items, public speaking medal (first place! ), dolls from Russia, and other homeless stuff. I didn't get to spring clean that before I left for Quilt Market, but I am still celebrating progress. 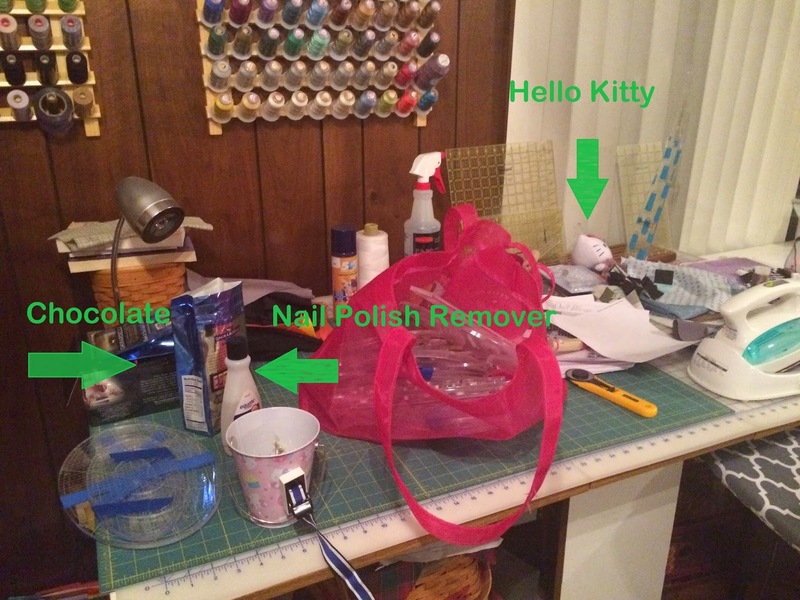 My sewing room isn't even close to clean, but it is definitely cleaner, more workable, and less embarrassing now. Today was the first day at Quilt Market in Minneapolis. It is where all of the manufacturers, designers, fabric companies and the like meet and show their wares to quilt shops so that they can provide lovely goodies for quilters for the next year. A lot of business takes place here, a lot of learning takes place here, and it's a bit of a family reunion. It has been 34 days since I've last had a Diet Coke. It's easier say no to Diet Coke when I'm eating healthfully. I was nervous coming to Market. Would I cave and drink a diet soda? Would I give in to the temptation of cake? Would there be any healthy convention center food choices? I walked my feet off! I may come home from Market a mere shadow of my former self. If that doesn't happen, I will at least come home to a cleaner studio. I'm participating in the #Springcleanyourstudio Blog Hop. Check out what the other bloggers are doing with their creativespaces. I'm getting ready to quilt my Sydney block from Pat Sloan's Globetrotting block of the month from 2014. I can't wait to get quilting! While I'm not quilting, though, I'm working toward #Springcleanyourstudio Blog Hop. Must all flat surfaces attract clutter? I think they gave me all of this lovely caffeine knowing that today would come: Monday, a day when I need at least one cup of each type of tea just to keep me going. Thanks everyone, you know me so well. If you are asking "What is that?" and "How did that happen? ", sometimes it's best to not know the answers to all of our questions. I learned something new yesterday. Don't judge me. Do you want a strawberry-blackberry-banana-chia seed-almond milk-chocolate smoothie spilled all over your sewing room? I rest my case. You see, my smoothie was really thick and I was tilting my head back and tilting the cup up but nothing was coming out of the cup. I was coaxing the smoothie, "Come on. I know you are thick but you aren't that thick!" 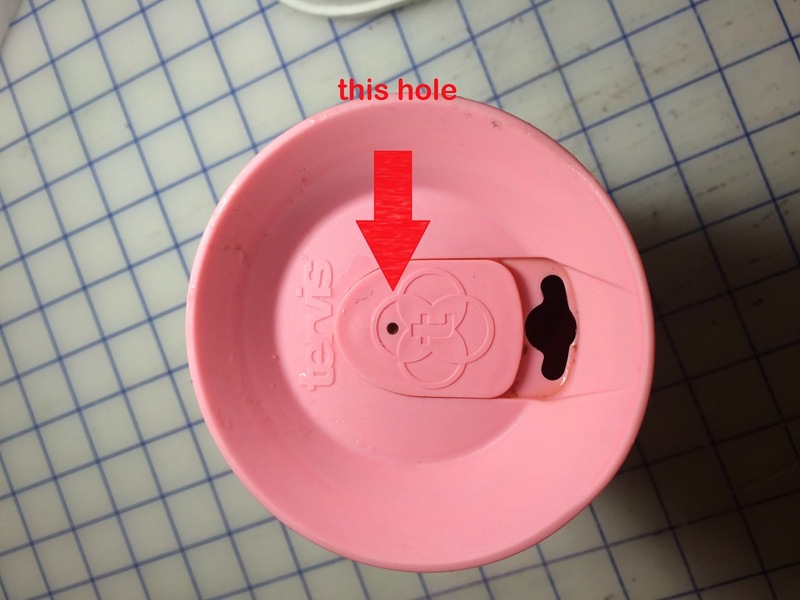 That's when I realized that my nose was covering the little hole and not letting any air into the cup. Once I moved my nose, I was able to drink my smoothie easily. For the rest of the night (until the smoothie was gone), I kept repeating to myself, "Move your nose, Debby" every time I tried to sip my smoothie. 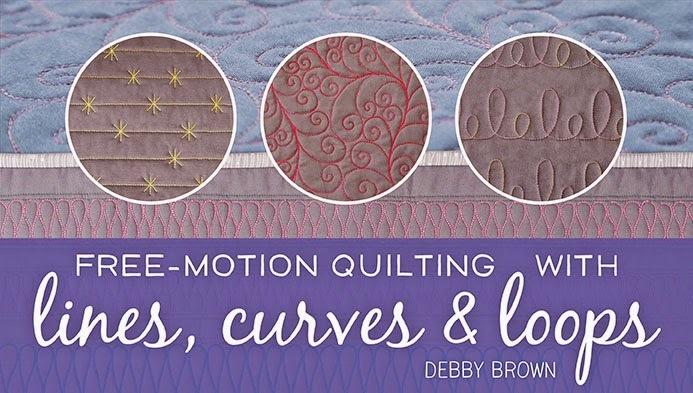 And you thought I only gave quilting tips. ...in preparation for this: #Springcleanyourstudio Blog Hop! Check out the other bloggers to see their studios SPARKLE!